Depending on who you talk to, everything is either fine, or we’re living in an oppressive cyberpunk dystopia in which we forgot to drench everything in colored neon lighting. There’s little to be done about the digital surveillance panopticon that stalks our every move, but as far as the aesthetic goes, [abetusk] is bringing the goods. The latest is a laser jacket, to give you that 2087 look in 2019. The build starts with a leather jacket, which is festooned with 128 individual red laser diodes. These are ganged up in groups of 4, and controlled with 32 individual PWM channels using two PCA9685 controllers. An Arduino Nano acts as the brains of the operation, receiving input from a joystick and a microphone. This allows the user to control lighting effects and set the jacket to respond to sounds and music. [abetusk] does a great job of conveying the tricks needed to successfully pull this off. The instructions should allow any curious maker to replicate the build at home, and code is available on Github to help run the show. There’s lots of detail on proper enclosures, connectors, and cabling techniques to avoid the wearer inadvertently pulling everything to bits when wearing the garment to the club. Remember, there’s nothing more punk than educating your friends. It’s an eye-catching build that would be an excellent addition to any Neo-Chicago street gang wardrobe. It’s not the first time [abetusk] has graced these pages, either – there are electroluminescent looks, too. Video after the break. Carl Sagan one said “If you wish to make an apple pie from scratch, you must first invent the universe.” It might not be a very accurate description of the relative difficulty level of baking, but the logic is sound enough: there’s often a lot of ground work that needs to be to covered before you hit your ultimate goal. A perfect example of this principle is the inflatable raft that [ralph124c] hopes to eventually create; before he can set sail he has to perfect making balloon animals with his laser cutter. In the long run, the raft will be constructed from sheets of TPU coated fabric that are fused together with a hot iron. But before he spends the time and money on building the real thing, he wants to do some scaled down tests to make sure his design works as expected. He makes a cryptic remark about learning the hard way that inflatables are prone to bouts of strange behavior, and out of an overabundance of caution we’ll just take his word for it. He hoped to test his designs with the much cheaper LDPE film, but he found that the hot iron didn’t fuse it together in the way he was hoping. His mind turned to his 60 watt laser cutter, and wondered if the desired effect could be achieved by turning the power down as low as possible and quickly moving across the material. His first attempts either blew right through the film or did absolutely nothing, but eventually he had the bright idea to move the laser farther from the LDPE. This put the beam out of focus, which not only expanded the area it would cover, but reduced the energy being delivered to the surface. With a bit more experimentation, he found he was able to neatly weld the pieces of material together. He even found that he could increase the power slightly to cut through the film without having to adjust the laser focus. With the ability to create complex inflatable shapes, perhaps [ralph124c] will create balloon version of Carl Sagan or an apple pie to celebrate. Of course, this technology isn’t limited to birthday balloons and model rafts. The ability to quickly and easily produce custom inflatable shapes could be a huge boon to anyone working in soft robotics, and we’ve even seen similar concepts applied to haptic feedback systems. As a society, we’ve largely come together to agree that laser pointers are mostly useless. They’re now the preserve of university lecturers and those destined to wind up in a jail cell for harassing helicopter pilots. Most pointers are of the diode-pumped solid state variety. However, [Zenodilodon] treads a different path. The laser cavity glows in operation, though it’s probably inadvisable to look directly at it. Instead of the usual DPSS build, this pointer packs an optically pumped semiconductor laser, or OPSL. 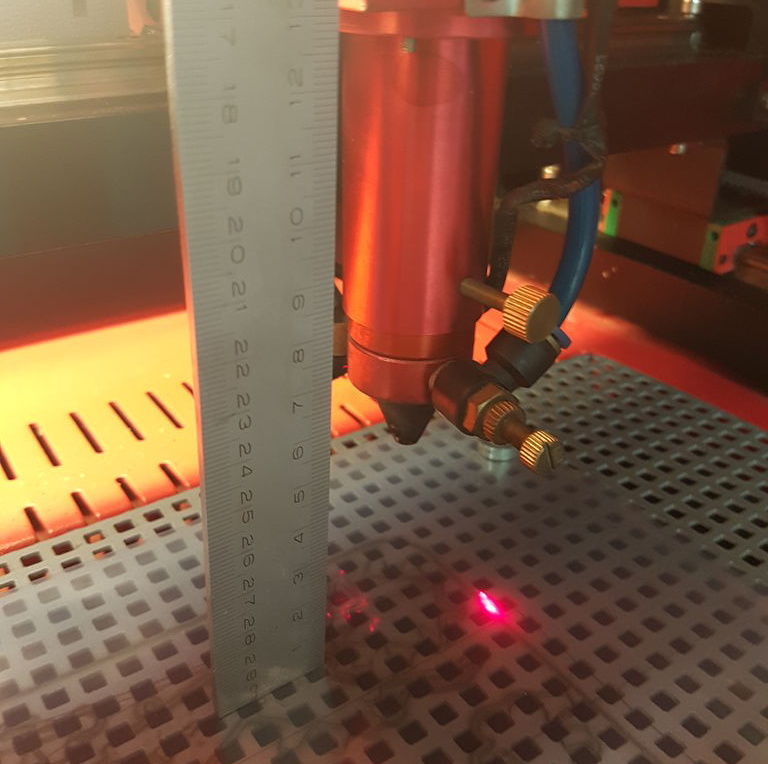 These lasers have the benefit of a wider selection of output wavelengths, and can be built to offer less variance in beam parameters such as divergence. The build is an attractive one, with the pointer chassis being manufactured out of brass, with several components plated in yellow and rose gold. There’s even a sliding window to observe the laser cavity, which glows brightly in operation. [Zenodilodon] goes into great detail during the machining process, showing all the steps required to produce a visually appealing device. It’s certainly one of the prettiest laser builds we’ve seen, and it’s always nice to see makers exploring different technologies. Similarly to our recently featured 1.4 W laser pointer, it’s largely a packaging operation, but if you’re building your own laser diodes at home – you know where to send ’em. Video after the break. Laser pointers were cool for about 30 seconds when they first came out, before becoming immediately passé and doing absolutely nothing to improve the boss’s quarterly reports presentation. However, just as with boom boxes and sports cars, more power can always make things better. [Styropyro] was unimpressed with the weak and unreliable laser pointers he’d sourced from eBay, so gutted one and began a fresh build. After fiddling with some basic 1mW eBay green lasers, [styropyro] had some fun turning up the wick by fiddling with the internal trimpots. This led to the quick and untimely death of the cheap laser diodes, leaving a compact laser pointer shell ripe for the hacking. To replace the underwhelming stock components, [styropyro] chose a Nichia NDG7475 high-powered laser diode, fitting it into a small heatsink for thermal management. Current draw was far too high to use the original switch, so the stock housing’s button is instead used to switch a MOSFET which delivers the full current to the laser driver. To reach the higher output power of 1.4W, the laser diode is being run over specification at 2.3 amps. All this current draw would quickly overwhelm standard AAA batteries, so a pair of lithium polymer 10440 batteries are substituted in to do the job. The build shows that with clever parts selection and some easy hand soldering, you too can build an incredibly dangerous laser pointer at home, that fits neatly in your shirt pocket. Alternatively, you might prefer something on the larger scale. Video after the break. We missed [iliasam’s] laser text projector when it first appeared, perhaps because the original article was in Russian. However, he recently reposted in English and it really caught our eye. You can see a short video of it in operation, below. The projector uses raster scanning where the beam goes over each spot in a grid pattern. The design uses one laser from a cheap laser pointer and a salvaged mirror module from an old laser printer. The laser pointer diode turned out to be a bit weak, so a DVD laser was eventually put into service. A DVD motor also provides the vertical scan which is just a slight wobble of a mirror. A Blue Pill CPU provides all the smarts. You can find the code on GitHub. Lasers work by emitting light that is “coherent” in that it doesn’t spread out in a disorganized way like light from most sources does. This makes extremely focused beams possible that can do things like measure the distance from the Earth to the Moon. This behavior isn’t just limited to electromagnetic waves, though. [Gigs] via [CodeParade] was able to build a device that produces a tightly focused sound wave, essentially building an audio laser. Curiously enough, the device does not emit sound in the frequency range of human hearing. It uses a set of ultrasound speakers which emit a “carrier wave” in the ultrasound frequency. However, with a relatively simple circuit a second signal in the audible frequency range is modulated on top of it, much the same way that an AM radio broadcast has a carrier wave with an amplitude modulated signal on top of it. With this device, though, the air itself acts in a nonlinear way and demodulates the signal, producing the modulated signal as audible sounds. There are some interesting effects of using this device. First, it is extremely directional, so in order to hear sound from the device you would need to be standing directly in front of it. However, once the ultrasound beam hits a solid object, the wave is instantly demodulated and reflected from the object, making it sound like that object is making the sounds and not the device. It’s obvious that this effect is hard to experience via video, but it’s interesting enough that we’d like to have one of our own to try out. It’s not the only time that sound waves and electromagnetic waves have paired up in interesting ways, either. What if I told you that you can get rid of your headphones and still listen to music privately, just by shooting lasers at your ears? The trick here is something called the photoacoustic effect. When certain materials absorb light — or any electromagnetic radiation — that is either pulsed or modulated in intensity, the material will give off a sound. Sometimes not much of a sound, but a sound. This effect is useful for spectroscopy, biomedical imaging, and the study of photosynthesis. MIT researchers are using this effect to beam sound directly into people’s ears. It could lead to devices that deliver an audio message to specific people with no hardware on the receiving end. But for now, ditching those AirPods for LaserPods remains science fiction. There are a few mechanisms that explain the photoacoustic effect, but the simple explanation is the energy causes localized heating and cooling, the material microscopically expands and contracts, and that causes pressure changes in the sample and the surrounding air. Saying pressure waves in air is just a fancy way of explaining sound.